A month or so ago, I managed to get out to Primark in my wheelchair. The last few months while I’ve been unwell I’ve been doing a fair bit of online shopping, but I really miss not being able to go to Primark! I know sometimes a Primark shopping trip can be stressful, and I’ve felt like I’m at a jumble sale when clothes are strewn all over the floor, but generally the Primark stores near me are pretty tidy and easy to shop in. I just love being able to go in and fill my basket with lots of pretty items, without worrying that I’ll break the bank. So anyway, going back to my latest Primark trip, I thought I’d show you my mini haul. Going round in a wheelchair it’s not particularly easy to look properly, but I managed to find a few nice bits and bobs. 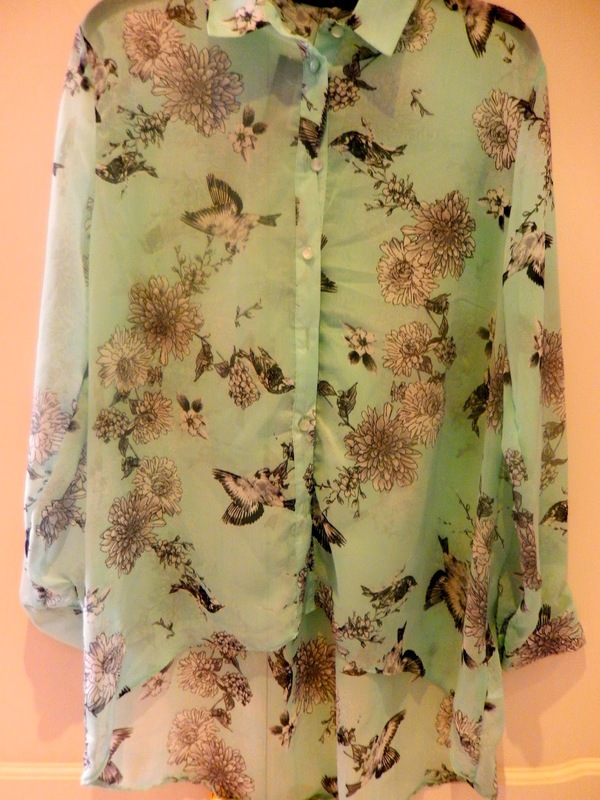 First up is this beautiful sheer mint blouse, which came in at £12. Slightly more expensive than some other Primark products, but it’s a gorgeous colour and design, and will be great to wear in the summer. It is also really versatile so can be worn for work with a vest top underneath and a pair of black trousers, or at the weekends with a pair of jeans. I’ve got a confession to make. I’m Jenny and I’m a shoeaholic! I don’t buy many pairs of heels, as I’m just terrible at walking in them, but nonetheless I love shoes. I tend to focus on flats and trainers, and could quite happily spend the day in shoe shops. The great thing about Primark shoes is that they’re not too expensive, are really comfy and it doesn’t really matter if they only last for one season because they’re affordable enough to buy a new pair for next season. These navy shoes have a gorgeous pattern on them, which is so pretty but doesn’t stand out too much. They were a bargain at only £4 – they also had them in white, which I really wanted but sadly they didn’t have my size. I fell in love with these tan pumps (£6) as soon as I saw them and I’m so glad I dropped a pair into my basket. The material they’re made from is so soft, so I shouldn’t be left with blisters after wearing them. And they’re perfect for any occasion, be it work, a garden party or just going for a weekend stroll in the sunshine. I didn’t plan to buy these pretty ballet flats, as my Mum was the one who was looking for them as she’d seen them before but they didn’t have her size. But when she showed them to me (and thankfully found her size this time) I couldn’t not buy myself a pair, especially for only £5. They’re so incredibly pretty and dainty, and will be brilliant for the summer months. Technically I guess these shouldn't be part of my haul, as I didn't buy them at the same time, but never mind! My Mum picked up these for me, as I'd actually put them in my basket but the cashier had forgotten to put them in my bag. They were a bit more expensive at £7, but are so comfortable and cute. Another of my favourite items to look for when I go to Primark is socks. I have way too many socks, but I can’t help buying more, especially when they’re cute and so reasonable at only £2-3. To be fair, I actually bought this pair as part of a gift for a friend, but I was so tempted to pop another pair in my basket – are you proud of me that I resisted?! I bought this pretty scarf as part of a gift as well, but for only £4 I was so tempted to find one that suited me too. They had so many different designs for such reasonable prices, but I was very good and just bought this one! I\d never really thought about buying beauty products from Primark before, but when we came to a stand full of products I was well and truly taken in. I bought all these as gifts for various people, but they were such great prices that I wouldn’t feel guilty treating myself. I especially love the cute butterfly nail files. Lastly, I bought these dainty daisy bracelets as part of a gift. I’m always a bit wary of buying cheap jewellery, as sometimes it can look a bit tacky and break easily, but these bracelets looked so pretty and well made that I decided to pop a couple in my basket. Looking round the jewellery section I was actually quite impressed with the quality, which seems to have improved since I last looked at their jewellery. Overall I think I did rather well on my little Primark trip out! Have you been to Primark lately, and if you have, what did you buy? Are you a fan of Primark, or do you avoid it because it’s too messy? I always see bloggers post so much nice stuff from Primark but I can never find any of it in store. I absolutely love that sheer blouse, the colour is lovely.